COLLEVILLE-SUR-MER, France — Proud veterans in their 90s and families of fallen soldiers are commemorating the epochal D-Day invasion of Normandy 72 years ago that helped the Allies vanquish Hitler. They held small ceremonies and moments of remembrance Monday along the wide beaches and cliffs where thousands of U.S., British, Canadian and French troops landed as dawn was breaking June 6, 1944. It was a pivotal moment in World War II, weakening the Nazis' hold on Western Europe after they suffered a punishing defeat in Stalingrad in the east. Henry Breton of Augusta, Maine, was among the shrinking number of D-Day survivors to make it to Normandy for Monday's anniversary. Speaking at the American Cemetery at Colleville-sur-Mer, Breton recalled landing in the second wave of boats, 35 minutes after the first, with the 106th Infantry Division. "We were off target," he said, describing the German counterattack, and ensuing violence and valor he experienced at the Battle of the Bulge in Belgium. "It brings back so many memories," he said, standing amid rows and rows of white crosses at the cemetery overlooking Omaha Beach. Visiting the D-Day beaches is a homecoming of sorts: Breton's ancestors came to North America from Brittany in the 18th century, and during the war he met a Belgian woman who was his wife for 62 years until her death in 2009. Some veterans expressed disappointment that Monday's ceremonies were low-key, especially compared with a sweeping ceremony for the 70th anniversary two years ago involving several world leaders. Breton, who describes himself as "91 and a half," is hoping this visit isn't his last. "I would like to be here on the 75th." People of many nationalities came Monday to pay respects. A group of Germans wrote the name of a regiment on the sand as a group of Spanish history enthusiasts dressed as D-Day participants walked nearby. Peggy Harris of Vernon, Texas, was unable to come this year to visit the grave of her husband, 1st Lt. Billie D. Harris. But a good friend, Janie Simon, brought flowers and a sign asking visitors to email photos of the gravesite to his widow. "She feels blessed that even though she lost Billie in this quest for freedom, people come here. That gives her great comfort," Simon said from the gravesite. Harris landed in Normandy on D-Day, was shot to death days later and buried by French villagers, but his wife didn't find out what happened for more than 60 years. "She never remarried," said Simon, who had an uncle who landed on Utah Beach and whose own husband fought in Vietnam. "It's a real love story." U.S. Army Air Corps veteran Hartley Baird from Pittsburgh sailed into Normandy in August 1944 and fought to liberate France from the Nazis. 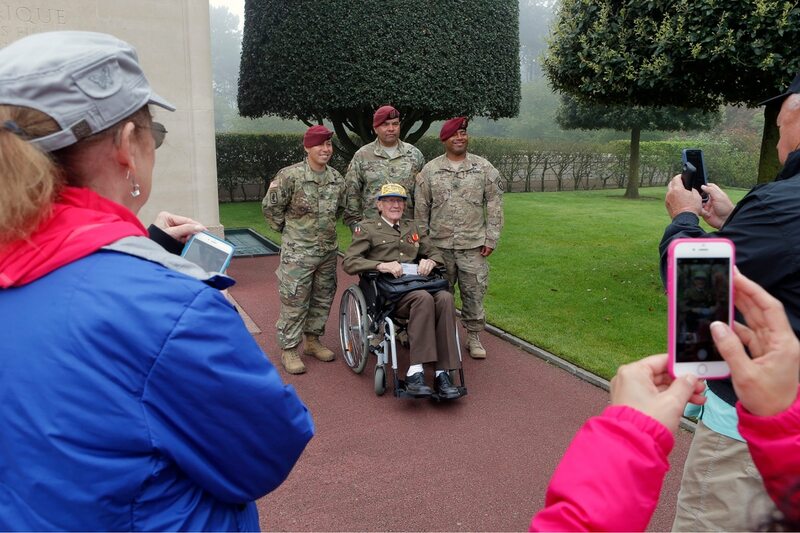 "I wouldn't have survived if the men hadn't cleared the way on D-Day," he said at the American Cemetery, where he came to pay homage to "the true heroes, those that are buried here."